Primary central nervous system (CNS) neuroblastoma is a rare intracranial tumor affecting children mainly in the first years of life. It is usually a supratentorial tumor with a wide spectrum of clinical presentation, seizures, and focal neurological deficits being the most common presenting signs. A 2-year-old child was admitted to our ward after a generalized seizure. Neurological examination was normal. Radiological studies showed a small DWI hyperintense lesion of the right rectus gyrus. Follow-up brain MRI 8 months later showed a huge growth of the tumor (90 × 80 × 65 mm) with polycyclic and apparently defined margins, cystic components, and diffuse contrast enhancement. Complete tumor removal was performed in two planned surgical steps. Histological diagnosis was CNS neuroblastoma. At a follow-up of 8 months, the child is in good clinical and neurological condition and is completing chemotherapy treatment according to the SIOP PNET 4 protocol. 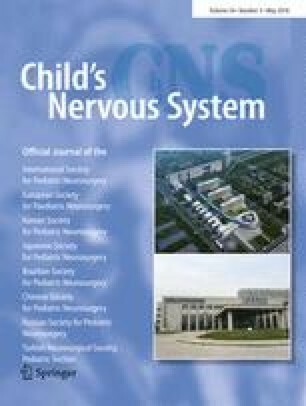 A thorough review of the literature confirms that primary CNS neuroblastoma has to be considered a distinct entity. The disease related mortality is 12.5%, lower than the one usually reported for other previously described as PNETs tumors. The most relevant factors influencing prognosis are the possibility of obtaining a complete tumor removal and age more than 3 years, which allows to include radiotherapy among treatment options. A correction to this article is available online at https://doi.org/10.1007/s00381-019-04100-8.